(UPM, Helsinki, 04 December 2018 at 13:15 EET) - European institutions have agreed on the Renewable Energy Directive REDII for the 2020s after the European Council adopted the agreement made earlier this summer. UPM welcomes the agreement that will increase the use of renewable energy to 32% in 2030 and requires 14% bioenergy to be used in transport. UPM Biofuels is one of the front-runners in the advanced biofuels industry. The UPM Lappeenranta Biorefinery, the world's first to produce wood-based renewable diesel and naphtha on a commercial scale, has proven the potential as a significant producer of truly sustainable advanced biofuels. UPM BioVerno, which reduces greenhouse gas emissions by over 80% compared with fossil fuels, has found a solid marketplace. 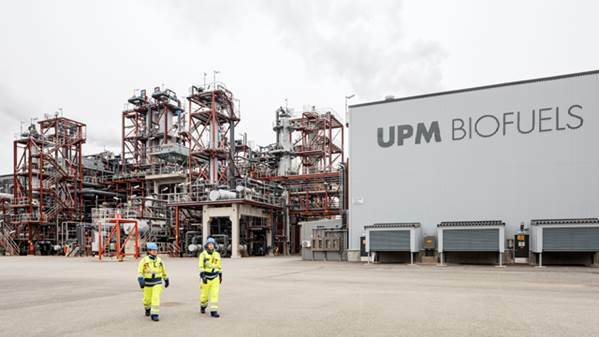 "UPM welcomes this agreement as it will further boost interest in the most sustainable biofuels and strengthens the position of advanced low-ILUC fuels. UPM BioVerno renewable diesel and naphtha are not competing with the food chain - and they are uniquely certified as having minimal risk of causing indirect emissions or land use change. Thus they are perfect for replacing fossil materials," says Sari Mannonen, Vice President, UPM Biofuels. "Advanced biofuels are now definitely recognized as a fast-track route to decarbonisation of transport across the EU. Furthermore, the recently published IPCC report highlighted the urgency of decarbonisation actions. We are pleased with the fact that an increasing number of countries are identifying ways to reduce transport emissions and looking at boosting the uptake of advanced biofuels. Sustainable biofuels play an important role in achieving the Paris Agreement targets," says Marko Janhunen, Director, Public Affairs, UPM.